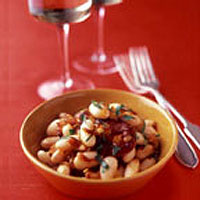 The spiciness of chorizo forms a delicious contrast to the creaminess of the cannellini beans in this rich little tapa. Heat the olive oil in a frying pan over a medium heat. Add the onion and fry gently for about 5 minutes until starting to soften. Meanwhile, remove the outer skin from the chorizo. Cut the meat into slices about the thickness of a £1 coin, then add to the onion and continue to cook until the chorizo turns golden and start to crisp. Add the cannellini beans and sauté for 2-3 minutes until warmed through. Season. Transfer to a warmed serving dish. Crumble over the dried chilli or chilli flakes and scatter over the parsley. Serve hot. This recipe was first published in May 2004.